HP is known less for innovative design than for producing reliable and affordable machines, but the Omen is a departure from this. It’s their new gaming laptop, and it’s striking from the moment you see it. The body is sleek, black aluminum. 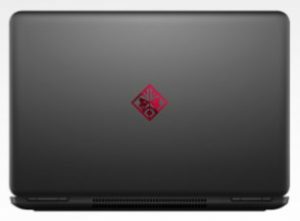 The lid is slightly wider than the base to create a tapering effect and also to offer a little extra screen space – the HP OMEN laptop is a 15.6-inch machine, rather than a 15-inch one. Once opened, the HP OMEN laptop still remains visually fascinating. The keyboard i s colorfully backlit, and rests between the two long, slender speakers with their own backlight. You can make changes to the speaker lights and to different zones of the keyboard, including being able to give the WASD keys their own unique lighting. A wider than standard touchpad provides room for better scrolling and gestures. The competing laptop most similar to the Omen is Lenovo’s 15-inch Y700 machine. Both are designed to give gamers a portable but still powerful experience. So how do they match up? As far as power, the two are approximately evenly matched. They provide 7th generation Intel Core i7 CPUs and varying levels of RAM based on what the customer is willing to pay. They both also offer upgrades of SSD storage capabilities for faster start times. The HP OMEN laptop lags behind a little in the optical drive department; the only option available is an external one. Lenovo’s product has touchscreen and non-touchscreen choices and a maximum resolution of 3840×2160. However, it is up to the potential user to decide whether this is really an issue. The higher resolution can be beautiful, but not all games support it, even if the monitor does, or the interface can become difficult to read at very high resolutions on a smaller screen. Additionally, a higher-resolution monitor consumes more power, leading to shorter battery life and a computer than runs hotter. The Omen certainly provides a more than sufficient experience for most modern games. If the user values these practical advantages over the bragging rights and occasional really stunning imagery possible on a Lenovo Y700 monitor, the Omen is still a great choice. All in all, anyone looking for a new gaming machine that isn’t oversized should definitely consider the HP OMEN laptop. Its surprisingly sleek and fun design and comfortable usability are a welcome surprise from HP, and it’s powerful enough to earn its title as a gaming laptop.